Mike Ross’ entire life is a gamble. Every day, when he goes to work, he is gambling that his secret won’t be discovered. That he won’t be exposed as a fraud, and his colleagues exposed as his conspirators. Baked into the premise, this gamble has always informed the series, a low hum droning in the background that will occasionally crescendo into a cacophonous roar when the story warrants. But before this season, his gamble has almost exclusively been dealt with on a story level, ignoring the very real character implications. It wasn’t until Mike got serious with Rachel and started to look toward his future that the gamble became about his character, pushing the nagging premise into something a bit more interesting. What makes Mike’s story finally interesting is that giving him a legitimate out forces Suits to actually deal with Mike’s secret in a manner that stretches beyond an external threat. The show already exhausted the usefulness of that story in season two’s fantastic Hardman arc, when Harvey and Mike were forced to bring Jessica into the loop to fight against a common enemy. To focus on an outside threat again would only seem like a paltry retread of something the show has done better in the past. What Suits needs to deal with now are the reasons Mike and Harvey are so willing to keep up this charade; so willing to put everything on the line every day even when it would be so much easier for them to do something, anything else. Mike spends this entire episode knowing in his heart he needs to get out. 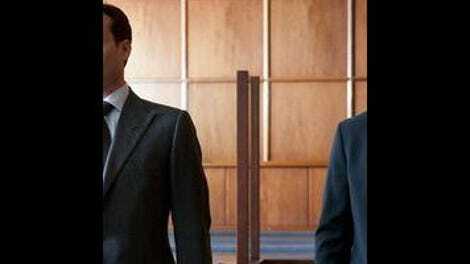 He even tells Harvey he is going to take the investment banking job. But in the end, he can’t do it, and despite the general success of this storyline, the reason he can’t get out is the one question Suits hasn’t quite figured out how to answer yet. Throughout Mike’s journey in this episode, I understood the choices he was making. I understood he realized he needed to make the mature decision to walk away and give himself a chance at a more honest life, for himself and for Rachel. I understood how hard it was for him to say those things out loud, especially when he owes Harvey and the rest of the people in on his secret at Pearson Hardman so much. What I don’t quite understand is exactly why he changed his mind. It came after a conversation with Harvey’s opposing lawyer of the week, a shady guy who got in over his head gambling and lost everything, and is now trying to basically extort Harvey’s client into settling a bogus lawsuit in order to protect their upcoming IPO. It’s a conversation very typical for this show, where the guy who seems like a bad guy confesses he’s not totally a bad guy after all, just a misguided guy who tried to do the right thing and got smacked down for it, and is now just trying to survive. What I can’t quite find—and what the show definitely wants us to find, at least as presented in the scene—is what about this makes Mike change his mind and decide to throw caution to the wind, have his hacker friend put his name in the Bar Association database, and stay at Pearson Hardman. This is the fundamental issue with the story as its being presented this season: I honestly have no idea who Mike Ross even is anymore. He’s not the idealistic con man from season one who was willing to screw people over, but only in service of helping out a more deserving party. He’s not even the slightly more jaded lawyer of season two who started to enjoy the thrill of the win as much as Harvey and proved he would do anything to get it. Now, his character is a lot less defined; beyond his relationship with Rachel, who does he want to be? How does his choice to stay at Pearson Hardman align with this? It seems as if this is the story that was supposed to explain these things, yet I’m still in the dark. Last week’s episode was a fantastic setup for Mike to make the big decision in a way that informed his character, wrapping up this season’s story into something potentially more meaningful. Instead his intentions are just as nebulous as they were before this story even started. Mike’s story touches others in the office, though, most notably Harvey and Scottie. Mike’s secret is the albatross around the neck of Harvey and Scottie’s relationship, the thing that’s going to constantly come between them until Harvey breaks down and tells her or breaks up with her so he doesn’t have to. It’s not the most compelling thing happening, simply because their relationship isn’t strongly defined enough to make either of those decisions hold any weight. The only consequence would be if Harvey told Scottie and she used the information for nefarious purposes—which she obviously would—so that likely will never happen, especially if Donna has anything to say about it. Next week is the season finale, and it feels like Suits is ever-so-close to really answering the above questions about Mike and having this six-episode arc make up for a very lackluster first half of the season. But ever-so-close is just far enough away to be dangerous. I don’t quite know how I feel about Jessica’s speech to Charles Van Dyke about being an asterisk, so I’ll just leave this open-ended for discussion in the comments. For the first time ever, Donna made me so angry I yelled at my television screen. Her guilt trip to Mike came out of love for Harvey, I know, but it was so obnoxious. 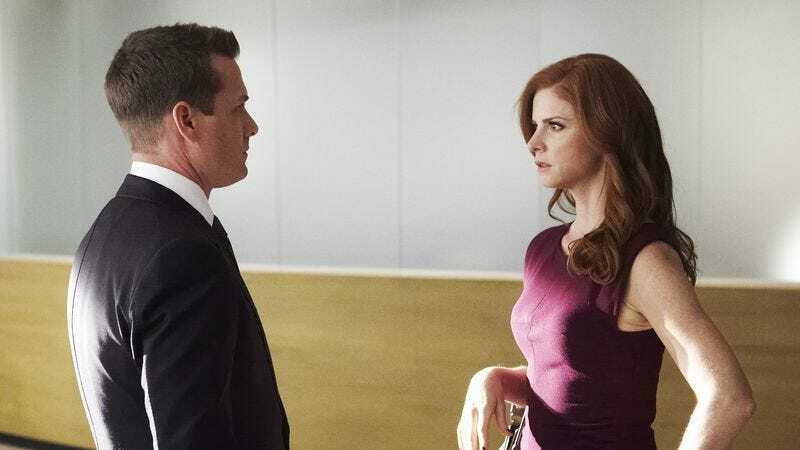 This season, Donna is basically just Harvey’s shadow champion and nothing else (with his relationship and with Mike), and it’s not working for me. Rachel’s advice to Mike to tell Harvey about the job offer because they’re friends seemed a bit tone deaf. Yes, they’re friends, but Harvey is still Mike’s boss. There’s an implicit power imbalance there. Louis Litt and Veronica Mars have the same taste in breakup music. Good to know.